I want to set the clipboard to file abc.jpg, in image format, so I can paste it to gpaint, etc. X11 applications, can I? I have enabled Screen snapshot feature in Compiz windows manager, and I need to give a command line to copy the snapshot image file to the clipboard. assert os.path.exists(f), "file does not exist"
Check out xclip. It allows you to move text, or files to the clipboard from the command line. [file]  as  the  filename  to save the screenshot to. One last option is to find an X app which just takes a screenshot when clicked (no prompts, dialogue boxes etc), assign it to a hotkey combination and use xdotool to simulate that keypress from the command line?? Now whenever you hit PrintScreen a sreencapture will be taken with an option to copy to clipboard, or just to save the file. You can use scrot with xclip to take a screenshot and copy it to clipboard. It will capture whole of your screen and copy the image to clipboard. If you want to capture current window then use -u flag. For selection of particular area, you can add -s flag. See $ man scrot for more options. As I read in other comments, you need it for copying a screenshot to the clipboard. I hope this answers your question. You can set keyboard shortcuts/keybindings according to your current Desktop Environment/window manager. It's being used as the file name. These are called format specifiers. They are of two type: starting with % or $. %F     Equivalent to %Y-%m-%d (the ISO 8601 date format). %T     The time in 24-hour notation (%H:%M:%S). %F_%T_ will print something like: 2018-06-17_02:52:19_ i.e. your current timestamp. You can customize the format as per your requirements. See $ man strftime for more help. $wx$h are part of the scrot's internal specifiers. So the final file name will look something like 2018-06-17_02:52:19_1365x384.png. Not the answer you're looking for? Browse other questions tagged ubuntu images clipboard compiz or ask your own question. Is is possible to copy binary data containing a NUL character to the X clipboard? 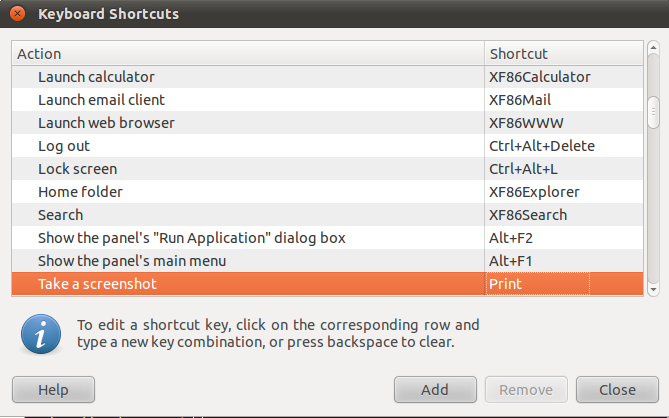 Screenshot will not copy to clipboard in Ubuntu 14.04 Unity desktop. How can I fix this?